After a stretch of sunny, warm weather that made Easter feel like summer, the rains have come again. But these are not the cold onslaught of November rains that lashes against the windows and the soul alike. No, these rains are soft spatters, falling gently on the newly planted grass seed, the pots of bulbs, and the trees laden with blossoms. These are the rains that bring the flowers. These raindrops sit like crystal drops on the frilly ranunculus that I admire from my breakfast table. Pink delights. Just as I type this rhapsody to gentle rain, I hear a noise and look outside to see heavy drops of rain slanting down. Sigh. All this rain makes me tired. I need a nap. Ranunculus flowers are stunning. A couple of days ago, I gave a yellow one to a friend and a white one to myself! The pink is beautiful, Lorrie, and I also like the arrangement of items on your table. Did you paint the birdhouse yourself? I agree - it has been pouring huge buckets of rain on us today - it was running off the neighbor's roof in sheets - I'd never seen it before. I think I'll have a cup of tea and a nap. Lovely flower photos. It is nice to have a nap while its raining --- so cozy! Lovely mosaic! Hope you have a great week! Rain has a soothing sound that does induce sleep. I like the birdhouse - did you paint it Lorrie? Thank you so much for the lovely surprise of your card in my mailbox -- such an unexpected solace. It looks and sounds like a lovely rain, Lorrie. You'll have lots of blooms popping from it. I like your photos, especially the ranunculus. Very pretty. Ranunculus are such pretty flowers, Lorrie! I love their colors. I also like your pretty birdhouse. What a funny day it was! I curled up too. Beautiful ranunculus -- great color. Rain refreshes everything. Love the birdhouse. Happy Day! I have never grown ranunculus, but I am inspired by your photos. I love to nap while it's raining. It feels so cozy. I've never grown ranunculus but I think I would like to. There are so many pretty colors. Love your mosaic. Yes, this is a problem with the April showers...you always need a nap. Happy Monday to you!! April and showers...they go together! 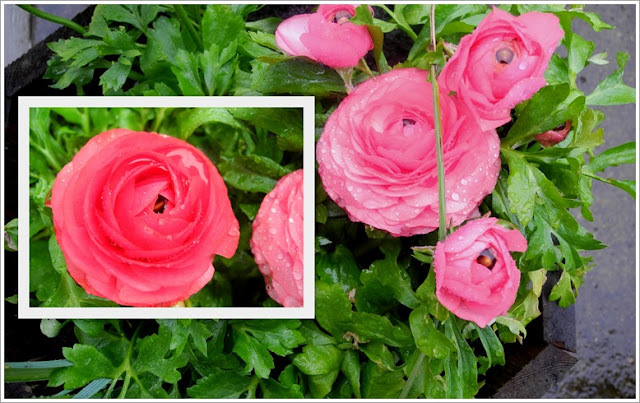 Your frilly ranunculus look lovely...especially beaded with raindrops. Love your photos, tulips, ranunculus...and is that other red and green plant a hen and chick? Raining that soft sort of Spring rain here today. I love it! It brings us green grass and beautiful blooms. ranuculus are one of my favorite Spring flowers. I usually plant them every year. Just an annual here. Didn't get any this year and I am missing them. Your pink ones are so pretty!